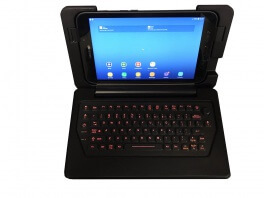 Ideal for Police/ Law Enforcement Vehicles, the new dual connectivity iKey keyboard is a perfect match for the Galaxy S8 and the new Samsung DeX™ docking station. Turn any monitor or display into a desk top experience! 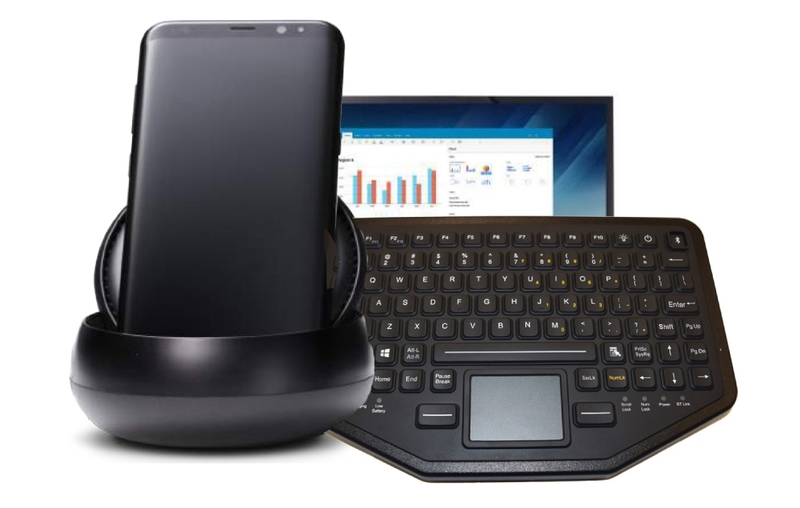 Galaxy S8/S8+ and a Samsung DeX, and the new iKey dual connectivity keyboard — connect via Bluetooth or USB. iKey is thrilled to be part of the most modern solution for public safety and law enforcement vehicles. Take a look at the Samsung DeX, the new docking station that lets your transfer data or files easily. Samsung DeX allows you to stay productive anywhere, and the right keyboard makes for the optimum solution. For the keyboard, iKey offers up our newest yet: dual connectivity keyboard, BT-870-TP. keyboard and a 13.3” flat panel display from iKey, IK-KV-13.3W, the police vehicle has a workstation that rivals any desktop solution. The BT-870-TP is fully sealed and made of industrial silicone rubber, built to IP67 standards. It is a ‘wired and wireless in one’ which allows for connectivity via USB or Bluetooth. It has an integrated touch pad and integrated battery. The keyboard is compact, at 2 lbs, and 2.03″ depth. The compact size makes this keyboard highly portable. For an even slimmer profile, take a look at our SLIM model, BT-870-TP-SLIM, which comes in at 0.85″ depth. Red backlighting makes either keyboard ideal for ambient light or nighttime. And dual connectivity gives you confidence that your device will work every time.